Short post this - I just wanted to share something that I've noticed over the past three months that gets very little attention in the office workspace press, which is currently obsessing over whether to sit or stand whilst at work. I've started getting in to the office earlier, and I have an east-facing window next to my desk. When I get in to the office, the first thing I used to do was turn on the lights. Now I don't and I sit at my desk for at least an hour with just the natural daylight coming in. And I can't tell you how jarring it is when someone from the 'west-side' (i.e. dark in the morning) comes in and turns the lights on. Daylight is far easier on the eyes, and more relaxing and comfortable than standard office strip lights - and it's surprising how dark it can be outside whilst continuing to work. Give it a try. YunoJuno is a very bicycle-friendly company. All three co-founders cycle to work, we've done London-Brighton and Oxford-Henley-via-the-Chilterns, and we're avid followers of Le Tour. So much so, in fact, that this time last year Shib (our CEO) announced that in 2014 he was going to head to Paris for the final stage. Fast forward twelve months, and we've moved the office over to Paris for the week in order to make this happen. Airbnb sorted us out with a great apartment in the 7th, complete with discordant jazz clarinet coming from the neighbouring flat. 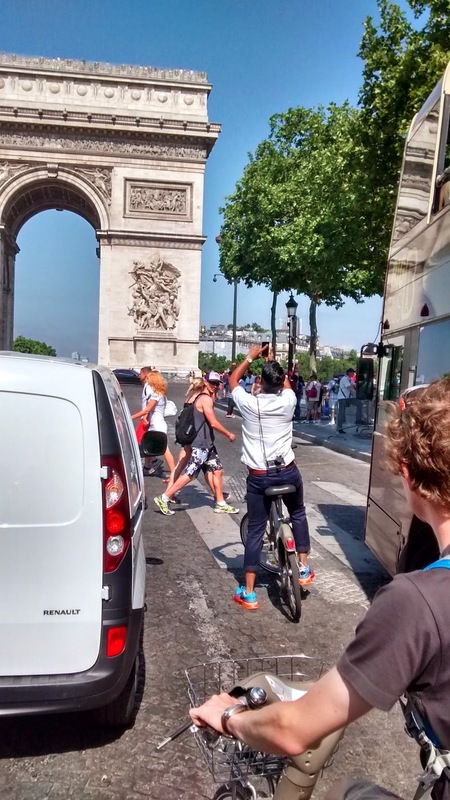 On the morning before the final we took to the Vélib' (the original city bike share) and cycled much of the final lap - including the full length of the Champs Elysee (up and down) and a circuit around the Arc de Triomphe. First thing is when to arrive. The timetable for the stage (available online) is pretty accurate, and the first 'event' is the arrival of the 'caravan' - basically a bunch of honking, hooting, carnival floats that precede the peloton by a couple of hours. We figured we should get to our spot at about the same time they did (so anticipating a two hour wait for the action). This is about right - we found a spot on the river, within the lap (so we got to see the peloton eight times), and the crowds were pretty thin at this time. Shib wanted to be close to the action, so he took the river side of the road, whilst I stayed on top in the Tuileries gardens, with a view down on to the road. And then we waited. And I fell asleep. And then it all kicked off. We had a fantastic view - I've posted some of my pics on Flickr, and Shib has some spectacular roadside action shots - we had about £4k worth of camera equipment between us, and of course the best shots came from an iPhone. And then it all ended. Being a little way from the end we weren't entirely sure it had happened - you lose count of the laps, and then suddenly you realise they're not coming round again. The medal ceremony is short and snappy, and an hour later the whole thing's disappeared. And throughout it all the crowds really never became a problem - someone came and stood by me and had a perfect view and he only turned up halfway through the race. Altogether it's a great experience - definitely to be repeated. A couple of weeks ago I decided I needed to get up to speed with GoT, and set about watching series 1-3, so that I could catch up to the latest series as it played out live. Sign up to NowTV, Sky's pay-as-you-go monthly streaming service, in order to access the old series. Watch half of series 1 using Chromecast from Android app - it's a great experience. Enjoy it so much I fork out for a NowTV box, so I don't even need to cast. Brilliant. This is future. Sky's licensing window with HBO expires - all episodes disappear from Sky. I am bereft. Cannot find old GoT on any other streaming service in the UK. Purchase US VPN to access HBO-Go. Discover that in the US, you have to sign up via your "TV Provider" - as I live in the UK, my "TV provider" is a metal stick on my roof. It doesn't support oauth. Send an SOS out on Twitter for solutions. Nothing comes back. Give in, and download series 2 via BitTorrent. I've already spent about £40 just to watch 6 episodes of first series, so figure I'm owed something. Wait about four days for torrent to download. Watch downloads using Videostream chrome app and Chromecast - it too is brilliant, but feel guilty about my crime. Guilt takes control, eventually finding series 3 available on Blinkbox, from Tesco. This is ironic, given that I spent two years building Tesco's first streaming service, before it was folded into Blinkbox. Find out that BlinkBox's Android app doesn't support casting, so have to watch from laptop. There's a terrible lag casting from a Silverlight app running in chrome, so I switch to mirroring via AppleTV. The Silverlight app threatens to melt my laptop. I've subscribed to two new services (NowTV and VPN). I've bought one new set-top box (NowTV). I've used a further two set-top boxes (Chromecast and AppleTV). I may even have broken the law? This the current state of TV. Despite my best efforts, I wasn't fast enough - so although I have now finished series three, and series four is available via my NowTV subscription - the first three episodes have already expired. And because the series is still in progress, it's not available for streaming anywhere else.